If you are going of holidays to Cairns or tropical Far North Queensland then the cheap hotels, motels and serviced apartments that are available on Budget stay will ensure that you don't pay the earth for Cairns accommodation. On budget stay you can make your holiday bookings with directly with these Cairns hotels and apartments, ensuring that you get quality accommodation at really cheap rates. Hides Hotel Cairns offers affordable discount Accommodation right in the city heart, just a short walk to the Esplanade, Night Market, Casino, Reef Terminal & Kuranda Railway Station. With public transport close by you will be able to enjoy the Great Barrier Reef, the Daintree Rainforest and all of what Tropical North Queensland has to offer. The wide colonial balcony provides a unique vantage point to view Cairns from, as well as offering a relaxing place to enjoy your Complimentary Continental Breakfast in the morning. The Hides Hotel Cairns has affordable motel rooms and Heritage-listed budget hotel rooms complete with lots of in-room facilities, as well as having a 24 hour reception and tour booking service, guest laundry, valet, limited secured car parking, pool and a 24 hour Internet Cafe or wireless internet in rooms and on the balcony. The Cairns New Chalon Hotel is located just 5 kms south of Cairns CBD adjacent to Cairns Golf Course and offers a range of affordable accommodation in Woree. Guests can enjoy many of the hotel facilities including lagoon style pool with waterslide, alfresco restaurant, sip a cocktail at the bar or relax in your air-conditioned room and order in room service. With a great, central location close to everything that Cairns has to offer the Cairns New Chalon is a popular accommodation for travellers of any budget. This Cairns property features a wide range of accommodation and facilities like business centre, direct internet access, faxing facilities, free car parking, guest laundry, massage, outdoor swimming pool, tour desk, baby cots available for families and daily housekeeping, which makes it a popular place to stay with all types of travellers. The Cairns New Chalon is a popular place to stay in Cairns because of its wide range of hotel facilities, central location and friendly customer service. Travellers who choice to stay in these budget Cairns hotel rooms will find themselves within close proximity of everything that the city has to offer. The Oasis Inn Cairns offers budget holiday accommodation that is ideal for business or holiday guests right in the heart of Cairns. It is perfect for family holiday accommodation or for singles or couples vacationing in the tropical north of Australia. With easy access to all of the major tourist attractions in the Cairns region the Oasis Inn Holiday Apartments is the ideal place for your next budget accommodation. It also features numerous guest services and facilities including disabled facilities, free car parking, guest laundry, outdoor swimming pool, tour desk, bbq facilities, garden and baby cots available for families. Conveniently situated just a short distance from the Oasis Inn Holiday Apartments are lots of popular destinations, as well as interesting things to see such as Cairns central shopping centre, Cairns business centre, the Reef Casino, Pier Market place, the lagoon on the Esplanade which is a free fun haven for families. Explore the wonders that make Tropical North Queensland a unique holiday destination with over 600 different day tours available in the Cairns area. The boutique style Cairns accommodation at the Great Northern Hotel is located in the heart of the city centre and features a range of double, triple and family room accommodation available at affordable prices. By choosing to stay at the Great Northern Hotel Cairns guests will be able to choose from a wide range of budget hotel rooms with discount rates available for longer stays. The central Cairns CBD location of this property means that it is within easy reach of many of city's major attractions, making it a great place to stay for corporate travellers and holiday makers. Conveniently situated just a short distance from the Great Northern Hotel Cairns are lots of popular destinations, as well as interesting things to see such as the Great Barrier Reef and the many islands that dot the coast, the Atherton Tablelands, the Daintree River and World Heritage Rainforest, scuba diving, snorkeling, fishing, white water rafting and hot air ballooning. For those holiday travellers who want more than a just your average hotel room the Coral towers Holiday Suites is the place to stay. This quality Cairns accommodation is extremely spacious, modern and taylored to the needs of families, groups, couples and singles. No matter the reson for you travel, business or leisure, the Coral Towers Holiday Suites provides discount accommodation in a great Cairns location. It also features a wide range of modern services such as child minding, faxing facilities, free car parking, lift, massage, spa, outdoor swimming pool, tour desk, BBQ facilities, baby cots for hire and babysitting service. Heritage Hotel Cairns provides modern, contemporary 3.5 star hotel accommodation, situated right in the heart of Cairns, only 10 minutes from the Cairns airport and a a short stroll from the world class Cairns Esplanade and only 3 blocks from the Cairns city centre. No matter the reson for you travel, business or leisure, the Heritage Cairns Hotel provides discount accommodation in a great City Centre location. It also features a wide range of modern services such as direct internet access, disabled facilities, free car parking, guest laundry, lift, room service, spa, outdoor swimming pool, tour desk, BBQ facilities, airport shuttle, baby cots for hire and daily housekeeping. Nestled amongst an acre of lush tropical gardens in the very heart of Cairns, you will enjoy the superb location and comfort of this family owned boutique hotel, the Bay Village Tropical Retreat and Apartments . The Bay Village Tropical Retreat Apartments is well located in Cairns, meaning that it is close to everything that the city has to offer. As well as this the property also has numerous guests facilities and services including bar area, direct internet access, faxing facilities, free car parking, guest laundry, restaurant, room service, outdoor swimming pool, tour desk, BBQ facilities, security and baby cots for hire. Comfort Inn Canon Park is a four star hotel located just out of the Cairns CBD. Shops and restaurants are within walking distance. Cannon Park Race Course is located opposite the hotel. 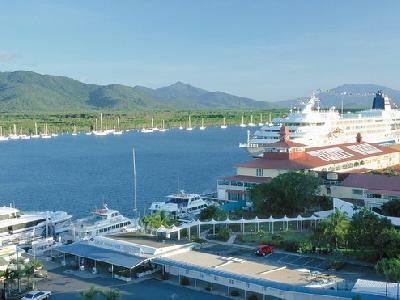 The picturesque Cairns Foreshore is within an easy 15-minute drive. No matter the reson for you travel, business or leisure, the Comfort Inn Cannon Park provides discount accommodation in a great Woree location. It also features a wide range of modern services such as bar area, conference centre, direct internet access, disabled facilities, faxing facilities, free car parking, guest laundry, restaurant, room service, secretarial services, outdoor swimming pool, tour desk, BBQ facilities, security, baby cots for hire and daily housekeeping. The Coral Reef Resort Cairns has fully self contained 1 and 2 bedroom apartments, resort style facilities such as a sparkling salt water pool, spa, BBQ area and tropical palm gardens and is the ideal budget family holiday accommodation in the beautiful Tropical North Queensland. Staying at the Coral Reef Resort in Cairns allows you to make the most of the many guest facilities at this affordable property, including the faxing facilities, free car parking, guest laundry, spa, outdoor swimming pool, tour desk, BBQ facilities and baby cots for hire. Tradewinds McLeod Holiday Apartments, Cairns offer 3.5 star self contained 2 bedroom serviced apartments at budget prices superbly located in a quiet environment on the fringe of the Cairns city centre. No matter the reson for you travel, business or leisure, the Tradewinds McLeod Holiday Apartments provides discount accommodation in a great Cairns location. It also features a wide range of modern services such as business centre, direct internet access, faxing facilities, free car parking, outdoor swimming pool, tour desk, BBQ facilities, garden, security and baby cots for hire. The Cairns Queens Court is located within the central city area of Cairns and offers pristine hotel / motel style of rooms and fully self-contained studio rooms. By choosing to stay at the Cairns Queens Court guests will be able to choose from a wide range of budget hotel rooms with discount rates available for longer stays. The central Cairns CBD location of this property means that it is within easy reach of many of city's major attractions, making it a great place to stay for corporate travellers and holiday makers. With a central location in the Cairns business and holiday travellers who choose to stay at the Cairns Queens Court will find themselves just minutes away from the recently renovated Esplanade and lagoon, a vibrant place for entertainment, the night markets, restaurants and cinemas. The knowledgeable staff will be able to assist you with booking a selection of tours or informing you all about the Cairns northern beaches. The Cairns Rainbow Resort provides budget priced resort style accommodation situated only 5 minutes from Cairns International Airport and Cairns city centre. Guests stayiong at this property can enjoy the sights on offer in and around Cairns and then head back to your motel accommodation to relax in the pool and beautiful garden surrounds. By choosing to stay at the Rainbow Inn guests will be able to choose from a wide range of budget hotel rooms with discount rates available for longer stays. The central Cairns CBD location of this property means that it is within easy reach of many of city's major attractions, making it a great place to stay for corporate travellers and holiday makers. Conveniently situated just a short distance from the Rainbow Inn are lots of popular destinations, as well as interesting things to see such as Cairns Central shopping centre and cinema, botanical gardens and nature boardwalk area, Great Barrier Reef, Green Island, the Cairns Esplanade and restaurant precinct, Casino, Cairns Convention Centre, Kuranda Skyrail and the historical tourist train to Cairns Highlands. Offering spacious, fully self contained 1 or 2 bedroom apartments The Citysider is just 1 kilometre from the heart of Cairns. Combining a range of resort style accommodation, friendly service and a great Cairns location the Citysider Holiday Apartments is the perfect place to stay for a business trip or holiday. This budget property also has lots of great facilities including child minding, free car parking, massage, outdoor swimming pool, tour desk, bbq facilities, landscaped garden area and even a babysitting service. The Citysider Holiday Apartments is situated within close proximity to the many of the major attractions around Cairns including a large number of day tours departing from The Citysider, reef tours, day tours of Kuranda, the Kuranda scenic rail, adventure tours, hot air ballooning & four-wheel driving. The White Rock Leisure Park in Cairns is the perfect budget holiday accommodation. Whiterock Leisure Park is centrally located off the Bruce Highway, as you enter Cairns from the South just 8 kms from the Cairns city centre. If you are looking for value for money hotel accommodation in Cairns then the Whiterock Leisure Park is the ideal place for you. This budget hotel features a variety of rooms that are designed for maximum comfort, as well as great amenities like direct internet access, faxing facilities, free car parking, guest laundry, outdoor swimming pool, tour desk, bbq facilities, landscape garden and baby cots available for families. For a long time business and leisure travellers have been staying at the Whiterock Leisure Park because of its unique home away from home feeling. Also the friendly and knowledgeable staff and excellent array of facilities at this White Rock accommodation will ensure that your stay in the city is completely free of troubles. Cairns Gateway Resort provide comfortable fully self contained studio apartments and motel rooms, making it an ideal destination for your next tropical holiday and all the comforts you need. Set on 2 hectres of tropically landscaped gardens with low-rise buildings in Australian Colonial style this budget Cairns accommodation will help you to save money on your next holiday. Located on the southern approach to Cairns, just 7 minutes drive from the city centre.